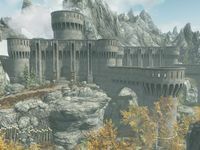 Fort Dawnguard is a large fort southeast of Riften which serves as the Dawnguard's base of operations. †The alchemy lab, arcane enchanter, and forge are not initially present in the fort, but added during restorations to the fort just before the Prophet quest ends. The fort is home to the ancient order of vampire hunters who guard the realm from the vampiric Volkihar clan. It is hidden in the east of The Rift, and can be used as a player home. It can only be reached via Dayspring Canyon. The fort was built sometime in the Second Era by the Jarl of Riften to contain his son, who had contracted vampirism. He hired a large mercenary band called the Dawnguard to guard his son. The threat of vampires was eventually disregarded by the people of Skyrim, and the fort was abandoned. Isran is using the fort as a base of operations for his attempt to rebuild the Dawnguard and combat the rising threat of the vampires. ^aThis person sells armored trolls for hire as followers for 500 gold. ^bThe presence of these people in this location is affected by quests and/or player choices in gameplay. Dawnguard: Speak with the leader of the Dawnguard. Awakening: Find out what the vampires are looking for. Prophet: Find and rescue a Moth Priest from the vampires. Chasing Echoes: Explore Castle Volkihar. Unseen Visions: Perform a ceremony to read the Elder Scroll. Five members of the Dawnguard are available as followers after the quest Prophet is completed. They are noted with the icon in the NPC table above. There are two war dogs in the dog pen in the northeast section of the fort, available as canine followers. You can buy armored trolls for 500 gold from Gunmar. There is a grindstone and tanning rack on the roof, reachable by climbing the west stairway inside and exiting at the top. These are technically in Dayspring Canyon, not part of Fort Dawnguard, though they can only be accessed via the fort. You can access Dead Drop Falls through the southwest section of Fort Dawnguard. The entrance is between three combat mannequins and the armored husky paddock. When placing a weapon on the weapon rack in the master bedroom you won't be able to retrieve it. Dawnguard gear intended to be equipped on the nearby mannequin is mistakenly set to respawn, which causes the mannequin to duplicate the gear every time the cell resets. This bug is fixed by version 2.0.3 of the Unofficial Dawnguard Patch. 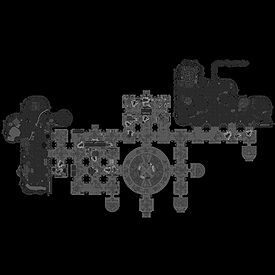 The interior of Fort Dawnguard is not oriented correctly, meaning that the compass points south when entering and exiting. This page was last modified on 30 October 2017, at 15:17.